The following describes the Config pane of the Create a BOM Table dialog box (Tools>BOM and Table>Create a Table of Notes.) The Config pane allows you to specify settings for saving and loading. This value represents the distance between the rows of the table: the larger the value, the greater the distance between the rows. This value represents the distance between the columns of the table: the larger the value, the greater the distance between the columns. If selected, the table is represented with the header as the top line and all the rows below it. If cleared, the table is represented with the header as the bottom line and all the rows above it. If cleared, the table has the standard left-to-right representation. If selected, the table is represented with the columns inverted. That is, the "first" column is on the right of the table and the "last" column will be on the left of the table. This represents the default template of the table. Every time you create a new table, the system loads the BTB (BomTable) file indicated in this field. This avoids your having to redo all the settings every time. The BTB file can be created using the Save To button, explained below. 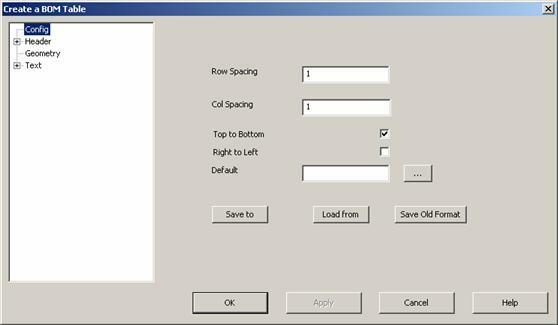 Using the browse button next to the field, you have the option selecting the file to place it in the field automatically. Use to save the table configuration with the BTB (BomTable) file format. The standard file selection dialog box appears. Use this button to load a table configuration previously saved in a BTB (BomTable) file. A standard dialog box appears allowing you to indicate the file to load. Once confirmed, the system loads the configuration into the dialog box. Use to save the table configuration with the TBL file format. The standard file selection dialog box appears.